Dwayne Rooke, from Devonport, Tasmania, the 31-year-old winterover cook at Australia's Davis Station, was severely injured when he fell off a quad bike while visiting Trajer Ridge, about 15 miles away from the station, in the evening of 20 October 2008. He broke his pelvis and both ankles, and was transported back to the station in a Hagglunds. Dwayne was in serious but stable condition, but his condition called for constant medical care, taxing the capabilities of the single doctor on station. 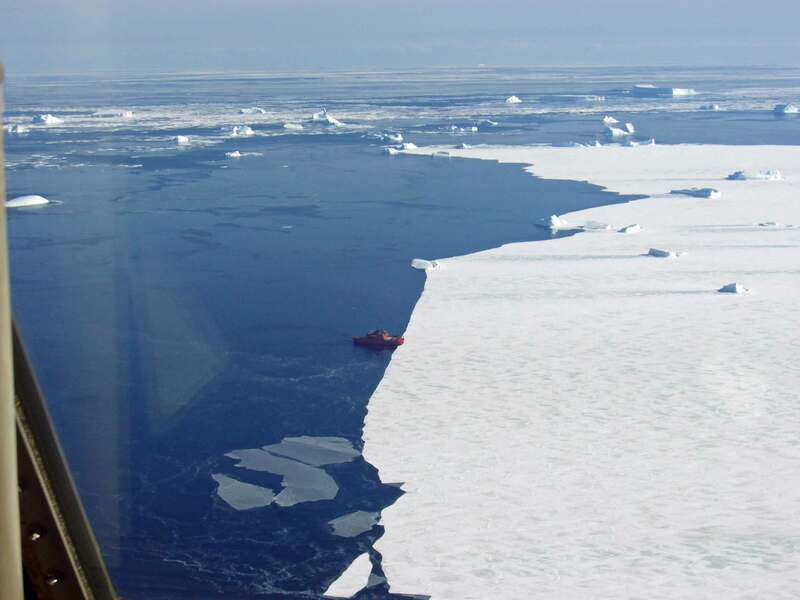 Initially the plan was to wait for the resupply icebreaker Aurora Australis, which was almost immediately diverted from its original course toward Casey. After weather delays, the vessel got within helicopter range on 30 October, and it finally became possible to fly a second doctor and other assistants to Davis on 1 November. At that time the plan was to fly him back to the ship when his condition and the weather permitted. Although one option at the time was for the ship to return directly to Australia, the plan was for him to be taken to Casey and flown back to Australia from there. But there were other plans in the works. Over the weekend of 1 November a combined American and Australian medical team flew from Christchurch to McMurdo, although at the time the operational plans where being kept quiet. They had to wait for 3 days for gales and other unfavorable weather conditions to subside. But late in the evening of Tuesday 4 November I walked into comms at Pole to discover that flight following was underway for a LC-130 that was headed from McMurdo to Davis Station. 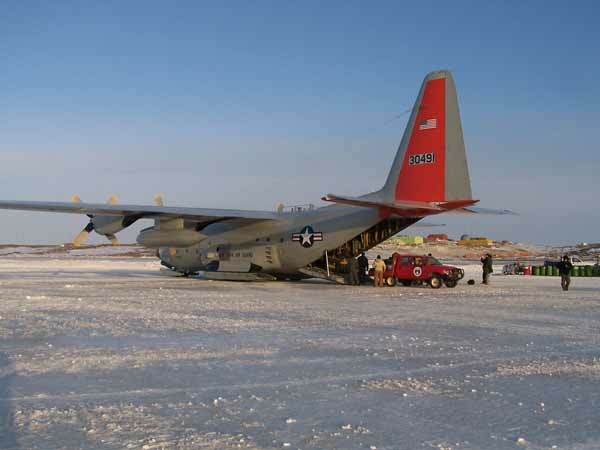 This was one of the ski-equipped Hercules aircraft operated by the 109th Airlift Wing of the New York National Guard (NYANG), and of course the main mission of these aircraft in Antarctica is to support Pole and other inland field operations sites. This 1500-mile trip took about 5-1/2 hours, arriving at Casey in the early morning hours SP time. 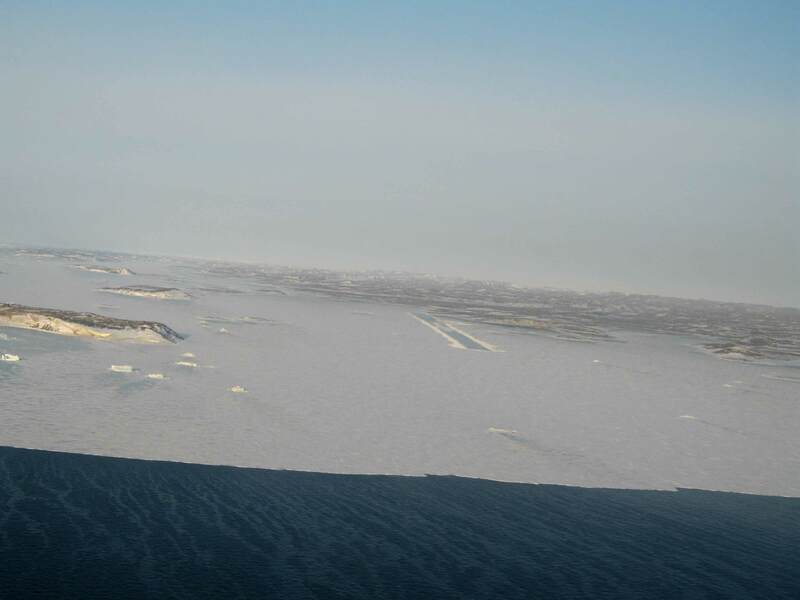 The landing strip was a 10,000-foot temporary runway that had been prepared on 6-foot sea ice in front of the station during the previous week...at right is a view of the ice runway from the flight deck as the aircraft made its approach. After the aircraft landed, the flight crew was very well treated--some of the station personnel vacated their rooms to accommodate the visitors, and the flight crew was treated to a big breakfast the next morning. Dwayne was transported to the ice runway (left) and put aboard the aircraft, which then headed north on the 3000-mile flight to Hobart, Tasmania. The flight took about 10 hours, and Dwayne, who was still feeling significant pain, was heavily sedated for the flight. He needed to be kept immobilized due to his injuries, which at this point also included a punctured lung. They landed in Hobart just before 0200 Pole time on Thursday 6 November, just before midnight Wednesday Hobart time (+11). Dwayne was greeted on arrival by his parents and sister. Below, an overview map of the flight route. The aircraft was piloted by Major Dave LaFrance, a native of Saratoga, north of the NYANG base near Schenectady. The medical team consisted of an Australian doctor and nurse, along with a 6 U. S. Army and Air Force medical personnel. 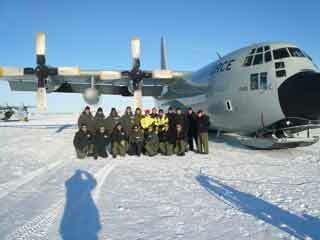 Also along in addition to the flight crew was a field aircraft maintenance team. 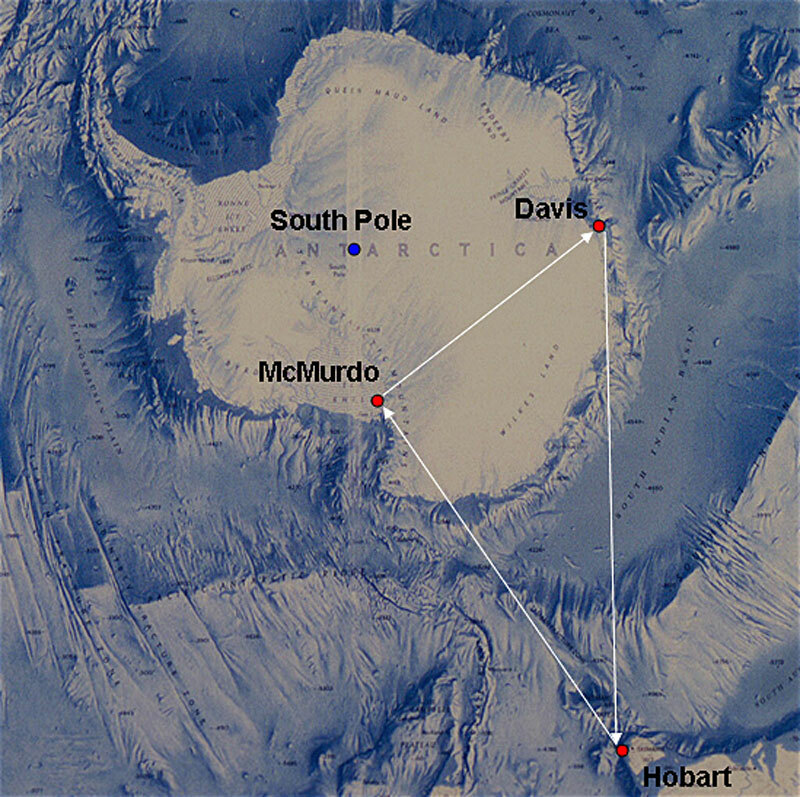 Upon arrival in Hobart, Dwayne was immediately transported to the intensive care unit of the Royal Hobart Hospital for surgery; the LC-130 returned to McMurdo a day later. In a press briefing in Hobart, MAJ LaFrance said he had been somewhat concerned about the rough surface he might find when he landed at Davis. If the surface had not been well-prepared, the weight of the aircraft could have created an ocean wave under the 6-foot-thick ice, and that might have cracked the surface in front of the aircraft. It turned out to be an excellent smooth runway, and station personnel commented, "You only used about of a quarter of the runway, and we prepared all this runway for you." MAJ LaFrance's response was, "Don't worry, I'll be taking off heavy so I'll use all of your runway then. Stopping is the easy part." 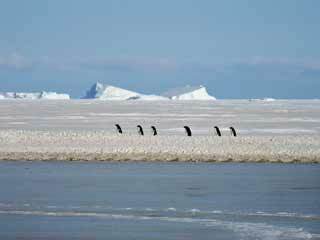 He said the greatest worry turned out to be keeping the penguins out of the way. 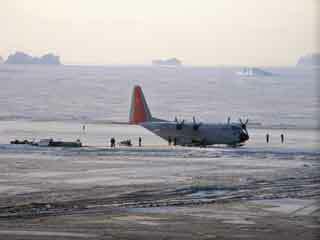 Below, left is another view of the aircraft parked on the ice runway, looking seaward. At right are a few of the runway inspectors. 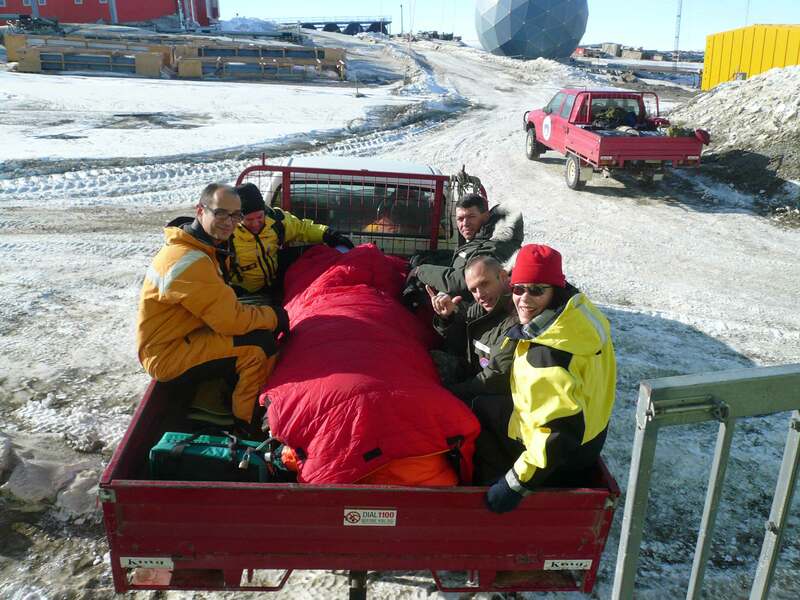 The Aurora Australis had originally been scheduled to call first at Casey...on board were the personnel and equipment to get the Wilkins Ice Runway near that station up and running to support the Australian summer science program. But delays caused by the diversion to Davis caused a 2-month delay in the flight operations. Half of the season's flights had to be cancelled, and they did not resume until the beginning of January. This set back many science projects and cost the program about $1 million. Speaking of the icebreaker, it seems that the storms that delayed the mission also broke up much of the ice and brought the ice edge 8 miles closer to Davis. At right is a view of the Aurora Australis waiting at the ice edge for the medevac mission to be completed so she could break up the ice runway and approach the station. As for Dwayne...he was still in hospital near his home in northern Tasmania 6 weeks after his return to Australia. The medevac effort required some extremely complicated coordination between the Americans, Australia and New Zealand, to gather the medical team, provide communications including flight following and met information, and confirm that the flight could be made safely. A number of news sources were used in compiling this page, but the main ones included the NSF press release, along with those from the Australian Antarctic Division (AAD) and the American Forces Press Service. All 3 of these include photographs; the AAD site at one time included a video of the 6 November press briefing. The map at the top of this page is from the NSF press release. And here is a report on the incident which was presented at the April 2009 Antarctic Treaty meeting in Baltimore (MS Word document). 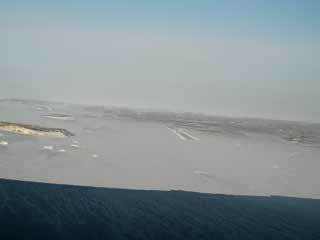 As for the photos, all of them are courtesy of Major Dave LaFrance, pilot of the aircraft. Dave has been flying on the ice for 10 years of the past 11--1998-99 through 2008-09, with the exception of the 2007-08 season which he took off because of the death of his son Connor. Thanks Dave! Below, some more people to credit--the whole crew (including the maintenance folks that prepped and launched the plane) minutes before the aircraft departed Williams Field.